Today was a very, very sad day. Beyond description. 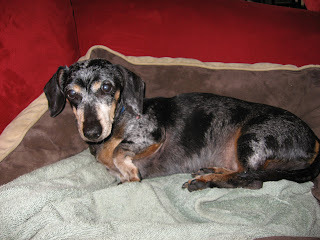 One of my best friends for almost 14-years - my sweet and precious daschund - Chelsea, died this afternoon. She was sick when we got home Sat night after I'd been speaking in TN. She seemed okay yesterday but got much worse this afternoon. By the time I got her to the vet she was gasping for her last breath. At first the Vet thought it was some kind of food poisoning or something because he couldn't figure out what was wrong. But after she died and we talked more about changes we've seen over the past few months with her vision and hearing, the Vet thinks she may have had a brain tumor that we didn't know about. Over the past two days it seems as though her brain, lungs and heart just started to shut down. It was the saddest thing I've ever been through. She was my constant companion. My shadow and friend. She followed me everywhere when I was at home and even traveled with me in the car when the weather permitted. She sat by my side when I read my Bible in my favorite chair, layed under my feet when I sat at my computer desk, cuddled up close to my side when I sat on the couch to watch tv, write radio shows, blog, etc. For the past few weeks though, she spent most of her time in her doggy bed. I'd have to go get her to come sit with me. I have sobbed all afternoon. I know I'll be okay, but I miss her deeply and don't know what my days will be like without her. I am so sad. My heart is heavy and I wish this hadn't happened now during a time when I want to be happy and focused. I know God's timing is perfect and I know her death today is probably God's protection from us losing her in our new home. This was her home for most of her life. I had been recently thinking about how stressful our move would be for Chelsea, since she was getting so old and doesn't like change. I am telling myself all of this to help me let go. It's not easy but focusing on what is true and on God's faithfulness brings moments of comfort in the midst of my deep sadness and grief. Monday was my little bit of nothin' day and boy was it needed!!! All that little bit of nothin' really helped me get rested spiritually, mentally, emotionally and physically. It also helped prepare me for "a lot of something" that was coming this week. I am glad I listened to God's nudge to be still. The rest of this week was full of preparations and packing. I have three speaking events coming up before we move so there were power points and outlines to send, messages to finish, ideas to finalize, etc.. Back to back speaking events and moving all in one month is crazy timing. I wouldn't have planned it this way if I had known months ago that we were moving. I didn't know, but God did. I never would've thought He'd plan for us to sell a house, buy a house, move in 6 weeks during a time frame when I speak the most. Yet, I can look back now and know without a doubt that God didn't make a mistake. You see, JJ and I pray about every event I speak at so we knew in advance that God had called me to share these messages and go to these places. We also know without a doubt He's called us to adopt, to move and is the only One who could sell our house in 20 days in this market. God also knew that I would need to be home this weekend. You see, I was supposed to go to the Gospel Music Association radio convention to represent Proverbs 31 radio show. I couldn't wait! It's the most amazing event. We get to meet all of the radio stations that air our show, hear the top Christian music/worship artists and even meet some. Last year I met and talked with Steven Curtis Chapman. We heard Bebo Norman, Mark Schultz, Aaron Shust, Point of Grace, etc. But a few months ago (before we put our house on the market) I sensed God telling me to cancel my reservation. I was so bummed. I really wanted to go. JJ supported me going because he and the boys are traveling with me some of events this month. But God knew I needed to be home. So in faith, I canceled. This weekend as I look at all we have coming up, I am so thankful I listened!!! This is my only weekend home without speaking before we move. So, we've needed to do some serious packing, and God has provided time and help in amazing ways. Next weekend JJ and the boys go with me to TN. The following weekend I speak in Goldsboro, NC. The next weekend I speak at our church on Mother's Day. I am so honored to be asked. But it's a first for me to teach the Sunday morning message. I know I'll be extra nervous - and extra dependent on JESUS!! That's a good thing. All of this is making me so dependent on Him. I wonder if that is why He planned it all this way. So, what is going on in your life? Are your days filled beyond your capacity? Do you hear God whispering that you can trust Him. Can you see how He wants to provide for you in ways you cannot provide for yourself? In the midst of the stress, looking for and seeing His provision gives me the peace and strength I need. Well friend, my blog may get a little sporadic in the next few weeks as we pack and move. I hope to have pockets of time to write but if I go missing in action, you know where I'll be! If you'd like to get an email notification each time I pop my head out of the boxes and post on my blog, you can sign up for Bloglines. Just click on the button in the sidebar and enter your email address. You'll get an email each time I post. Have a great weekend! It's past noon and I'm still in my pajamas. I am pretending it's Saturday morning, trying to rest up for a busy week of work and packing! Thanks for your prayers for the wonderful women's retreat on Amelia Island in FL this past weekend. It went great! I really needed and felt your prayers. I was so tired and my head was pounding by the time I got to the event Friday night, but my sweet event coordinator (Suzanne) kept looking out for me and praying for me. When I opened my mouth and my Bible, He showed up! My headache faded and His presence filled me. The women were so sweet, so encouraging and so hungry for God's Word. Women of every age shared stories of how much God had spoken personally to them. I love it when He does that in a detailed way so we know it's HIM speaking to us. To all my new friends in FL, I am praying for you today - that you will drink deeply of His love, seek His purpose and plans in all you do and move closer to Jesus throughout your day listening to Him speaking words of Truth to your heart!!! The winner of our drawing was Karen Monk! Now back to my pajamas...this weekend's conference was about balance. I shared how several years ago I ended up in a really hard place, totally overwhelmed and discouraged. My weeks were filled with random acts of chaos. I randomly decided what I was going to do each day based on 1) how I felt (should I do something fun? something productive? something creative? something easy?) and 2) what everyone else needed me to do. I didn't have a plan and my schedule was a mess. Every week was different - no rhythm, no reason, no purpose - just surviving each day and hoping the next would be better. Finally I asked a friend for advice. She and I told me to write down all that I did each day of each week. By the time I completed that assignment, I could barely read the piece of paper. She then asked me to list my highest priorities, hoping to add order to my days. She mentioned the dreaded word - schedule. I wrinkled my nose. It sounded boring. I liked being spontaneous! But as Mary pointed out, it was killing me! She challenged me to make a list of what I wanted to invest my time and my life in, and then schedule those things and people into my days each week. Time with God, dates with my husband, fun with my friends, face-to-face activities with my kids, reading, work, ministry, walking, managing our home, and refueling my soul with rest and down time. I knew that if I didn't take her advice, I'd end up in a pit of depression. This over-achieving, people-pleasing lifestyle had led me there before and I didn't want to go back. God created us to live lives of balance. I don't always get it right but I try to learn from my mistakes. Like when I used to come home Saturday night or Sunday after speaking and jump right into the week. I wouldn't give myself a week-end; the week before just became part of the week after. Then I'd wonder why I felt discouraged and depleted, unsure about how I could do the next thing. Sometimes we need to step back and adjust how we're living and move things around to find balance. Sometimes we need to give ourselves permission to do nothing. To just rest. And we need to remember that life was meant to be lived, not survived. I have learned the hard way that I can't be it all and do it all, all at the same time - not even Jesus tried that - so why do I? Well friend, for just a little while longer, I am going to do a little bit of nothin'. I hope you'll give yourself permission to do the same sometime soon. As I have shared before, I even have a hard time staying connected with friends who live in the same town now. I am closest to those I see most often - at work or at church or in the neighborhood. There is just something about my current season of life - working, traveling, older kids who have different friends and interests, days that fly by at light speed, and never-ending new adventures like adopting, moving, learning radio, etc . It used to be easier when my kids were smaller and my friends were moms with the same age kids. Play dates with our little ones gave us the perfect incentive to get together. It was our only guaranteed adult conversation so it was also a survival tactic. I loved having so much in common and feeling like we were learning things together and could encourage one another in something we were all so new at. Now that I think about it, it was also easier before then - when I was single and could go out for lunch or dinner with my co-workers and roommates. Even after I got married before kids, there was more time in the evenings and on weekend. But I do remember it took a lot of effort, trial and error to find other couples that both JJ and I liked to hang out with. I am getting ready to move again in just a few weeks. I won't be going far - just a few blocks away - but I know it will be easy to lose touch. But I want to keep in contact with my neighbors and friends, Jan and Kim, who have lived next door and across the street for almost 10 years. God's timing of this friendship series is so good for me because I know it will help me be intentional in giving them a call and just getting together for no reason - except for the fact that at one time God made us neighbors and now we're simply friends. I really want to be better at staying in touch with my O.O.T friends, so if you have any ideas please share them. PS. I fly out tomorrow afternoon to speak in FL at a retreat Friday night and Saturday. I get to meet some new friends and spend time with my sweet friend and asst. Aimy. It's been such an exhausting week so I'd treasure your prayers for God's strength to be perfected and His power to be revealed in my weakness. Thank you sweet friends! I am sitting in my bed with my laptop and I am so stinkin' tired it's not even funny. JJ looks at me and smiles. Why don't you just go to sleep? he asks. I explain that I need to touch base with my bloggy friends and let them know how my lunch went on Friday and how we're all encouraging each other to reach out and then share what happens. He smiles and turns on the basketball game. So much happened the past few days. (If you want to know more click here.) Life has been quite the whirlwind, but in the midst of it all, I enjoyed a little oasis of simplicity with my girlfriends Bev and Sharon. They are the two that came over for lunch on Friday. I wanted to serve something special but I was running out of time. I got consumed Thursday by work and house stuff. By Friday morning I still hadn't confirmed our time, place or menu. I called Sharon to get her suggestions. She gently encouraged me to keep it simple. "Who cares what we eat? It's being together that matters." Then I called Bev to let her know we'd decided on noon and I was getting croissants and chicken salad if that was ok with her. I could tell by her tone that she loves that combo just as much as I do. She even told me where to get some great chicken salad with grapes and walnuts - Lowes Foods - oh so yummy! I had also called my friend Jen earlier that morning between carpool and helping in the school store that morning. We'd decided to go for a walk so I could show her the home we were hoping to buy. She came by at 1oam. We walked the few blocks between my current home and new home, peeked into all the windows, and then walked back to my house while talking about different things going on in our lives. We only had an hour together but it was another oasis of simplicity at the end of a chaotic week. When I got home, I jumped in my van and ran to Lowes to get lunch. I pulled into my driveway just as Sharon and her 5 yr old Madeline were getting here. We went inside and set up our simple lunch - store bought chicken salad and croissants, along with Sharon's freshly cut cantaloupe and pineapple. Madeline requested a movie - Thumbelina- while the rest of us girls just ate and talked. Our conversation was so sweet, yet so simple. We talked about things we'd been thinking about, struggles/changes we were all processing in life, simple joys we'd experienced recently. One that I remember well was something Bev shared about how reading blogs has helped her see that women are so much alike. She's enjoyed reading the responses to Jodie (Pearls) questions about a woman's 10 greatest struggles. Mostly because it reminds her that she is not alone. I think that is a simple truth about women and friendships. We want to know that we aren't alone, we aren't the only ones who think the way we do or feel the way we do. We long for that simple, yet common connection...face to face and heart to heart. Tomorrow I am getting together with two friends and their two little ones for lunch. I can't wait to see them and just have time to talk and get to know each other. This is the first time we have ever gotten together for lunch. We met through church. Our families are in a small group together but we've never done anything with just us girls. After all of our talk and prayers about friendship this week, I prayed that God would show me one way to connect with a friend. Immediately the women in our family house gathering (that is what we call small groups) came to mind. There are nine women in our group - many work, many have small kids, many live pretty far from me. So, what was my initial thought after getting the idea to invite them over for lunch? You guessed it...I thought, "I bet they won't be able to come." But then I thought about the many things we've shared about wanting friendships more than it seems like others want them. Not having time for friends. Others being so busy. I knew these are the things that keep us from reaching out. I also realized that my life is so busy that many probably assume I don't have time for them. So, I decided very intentionally not to listen to the threat of disappointment. I knew God just wanted me to open my heart and home. He would smile on my obedience and I could trust Him with the results. If no one could join me, I'd have lunch with Jesus. So, out of the nine women I invited, two can come!! And you know what? I can't wait to have that time with just them. I know that when two or more gather in HIS name, He shows up in a very special way. I am praying He'll bless our time with the sweetness of His presence. Honestly, even if only one of my friends could come I'd be excited. God has taught me over time that my value as a friend is not measured by how many friends I have. It's measured by the love in my heart, the encouragement of my words and the reach of my hands as I seek to love God and my girlfriends by reflecting the kind of friendship Jesus offers me. PS. Life is swarming with adventure at the Swope house. Please visit my family blog for an update. 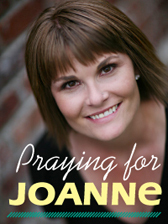 We'd treasure your prayers! Hello friends. Thanks for sharing your hearts and thoughts so transparently. I have read each of your comments and am praying for each of you today. Wow, we all have so many similar stories. Isn't it so good to know we're not alone. How about we take a few days to talk through our thoughts and questions here on my blog. Promise me you'll remember I am not a friendship expert. But also know that I can relate to every single one of you. I wish I had just the right answer for every question, but I'm not sure I will. However, I know Someone who does, so I'm am going to seek His perspective in prayer and share with you what He's showing and has shown me. Here is are some of the things that were mentioned in yesterday's girl talk comments: fitting friendship into busy schedules - yours and theirs, getting hurt, feeling rejected or unwanted, trusting again, when no one seems to need a friend, moving away and starting over again, feeling like you're imposing, not knowing how to make friends, being a dumping ground for others problems, friendships that become unhealthy, dealing with misunderstandings and conflict, creative ways to spend together, friendships with purpose, seasons and reasons for certain friendships, being open to new friends, not taking friendship challenges and changes personally, letting Jesus be our best friend. I have to leave for work soon so I'll be back to share more tomorrow. Today, I am going to glean from these great insights Laura B. shared in her comments about what she's "learned along the way." God is first - He has always been the one true friend who doesn't disappoint, disappear, or disengage! Prayer is vital - Pray that God will provide the friendship(s) you need and desire, and that He would show you which ones to let go of and which ones to focus on. Sometimes we try to hold on friends that were meant to be there for us in a special season of our lives - when God may have another person in mind for the next season, or for your long-time, 60 year-old best friend. Purpose is a must - When you find that special friend (or friends), or if you already have that friendship, you must pursue it. Make sure you both agree on what friendship is, and what makes you feel close as friends(i.e. some people need to connect with their friend(s) daily, while others are more casual about it).Be intentional about your time together - schedule it on the calendar as a commitment (not optional) - and get together as often as you can - even if just for 30 min. of chatting at Starbucks. Stay in touch - You may hit a truly busy season in your life that forces your friendship time to the 'back burner' for a while. There are thoughtful things you can do during that time that only take a minute, but leave a lasting impression on your friends. Send an upbeat thinking-of-you card and drop it in the mail with a note that says 'Sorry I've been so busy... missing you' and suggest a tentative future date to catch up. Drop by their work or home with a special note or gift saying I just have minute but wanted you to know I'm thinking of you. It helps to maintain the closeness of the friendships when time can't stretch far enough. Always forgive quickly - Quickly is the key here, before an offense has time to take root and grow. You treasure the friendship and no offense is worth losing it over. If you run to God immediately, He will take care of everything, and you can continue to take care of your treasured friendship. I love all of you to pieces and treasure your friendship in this journey called life. For now, how about we each ask God to show us one way to be a good friend to someone we know or meet today. I can't wait to hear what happens.